Ahhh, Spring! This season gives us a lot to look forward to – warmth, flowers, sunshine and, for the traditional Bermudian, hot cross buns and fishcakes! Thankfully, for me, one does not need to eat fish in order to enjoy this Good Friday treat — chickpeas to the rescue! This POWERHOUSE of a legume is a staple in many a vegetarian’s diet and with good reason. The chickpea is abundant in proteins, carbohydrates, healthy fats, B vitamins and minerals and can aid in reducing cholesterol, avoiding constipation and calming the nerves. But if that does not excite you, hopefully today’s recipes will! 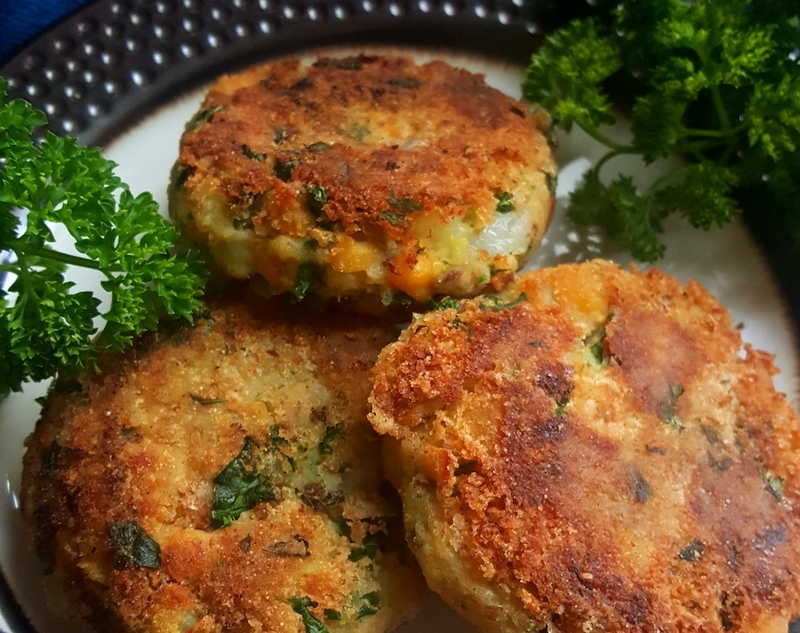 First, we have Chickpea Kale Cakes (or just call them fishcakes…your friends will never know!) You could exclude the kale, but I promise it is mostly undetectable! 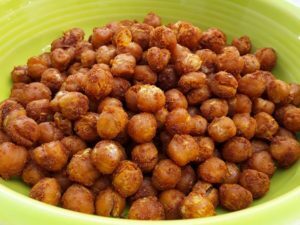 And if you fancy a salad topper or delicious snack to accompany your meal, give the Roasted Chickpeas a try! Prepare flax/chia seed egg (1 Tbs ground flax or chia seeds plus 2.5 Tbs water, let sit for 5-10 minutes). Place onion, kale and parsley in food processor and process until finely chopped OR chop manually. In a large bowl, mash chickpeas. You may need to use your hands. Small chunks are okay. Add potatoes and mash together until relatively smooth. Small chunks are okay. Add breadcrumbs. Mix until thoroughly combined. You want to achieve a firm mouldable mixture. Portion and shape burgers into a desirable size and coat lightly with flour. Fry in oil on medium-high heat, approx. 3 minutes each side, until golden. *These can also be baked (minus the flour) at 350° for 15 minutes. Flip then bake for an additional 10 minutes (Not as tasty but healthier). In small bowl mix together dry ingredients. Lightly spray frying pan; apply medium heat. Pan seer chickpeas over medium heat for 2 minutes. Remove from heat and transfer to medium sized bowl. Immediately mix in dry ingredients. Stir until chickpeas are covered. Transfer chickpeas to medium shallow baking pan. Bake on middle shelf for 30 minutes. If you have a recipe you’d like to see revamped or ‘veganised’, join Sasha’s 50 recipe transformation challenge by clicking here https://pages.convertkit.com/21f9e5fbdf/482c71bc2c.